I started my Amazon business back in 2014 and since then I have created 4 brands, expanded throughout the US, UK, Germany, France, Spain and Italy and launched a good chunk of products in each of those marketplaces. I have been optimising my launch system for 3 years now and I now use it in every product launch to get me to the top of page 1 in as little as 4 weeks, sometimes even less! When building this system I focused on speed and longevity of search rank because we have all seen the magic products that pop up on page 1 with no reviews, a poor BSR and then disappear a few weeks later. You need a system that will help you rank fast and stay there so that you can reap the rewards for years to come. Guess what, this is the system you need! o you’re looking to scale your Amazon Empire? You probably already know that the best way to grow your Amazon business is by adding more products right? But that means doing more product launches, and after the latest review changes no doubt your finding it harder and harder to dominate page 1 without a clear launch strategy? But what if you did have a crystal clear strategy? One proven to work, that has a track record of getting products ranked to the top of page 1 in as little as 4 weeks? Not only that but imagine if there was a way you could automise your product launches? Think about it…if you could launch more products, with less effort and get ranked faster than you ever thought was even possible, what would you do with the time you saved on each launch? How valuable do you think that would be to your business? Your bottom line? Your weekends? I’m Swedish Dan and I started my Amazon business in 2014. Since then I have expanded across Europe & the US, created 4 brands and launched a good chunk of products along the way. I’ve created the 60 minute launch system to make time consuming, underperforming, costly Amazon product launches a thing of the past! My system is not only a reliable way of ranking to the top of page 1, it also takes less effort than you could ever imagine. In fact once I decided to take my launch strategy and make it availble to you, I made it so that you could literally plug in product after product and have better, faster and more lucrative launches than you’ve ever had before. Picture being able to copy my system, my years of work and optimisation and use it in your business time and time again to have hugely successful product launches where your competition don’t even have time to react to you entering the market before it’s too late for them! This system has helped me to rank product after product, time after time and continues to work and in fact works better now than ever before after the reviews changes of October 2016. I guarantee that you have not seen anything like this before, it’s not that I am some genius or that I have come up with some trick to hack the algorythim. I have just spent a lot of time and money testing out different ways to launch products over the last 3 years, so much so that I have started to see the patterns emerge. Quick ways, or hacks or tricks get people suspended. 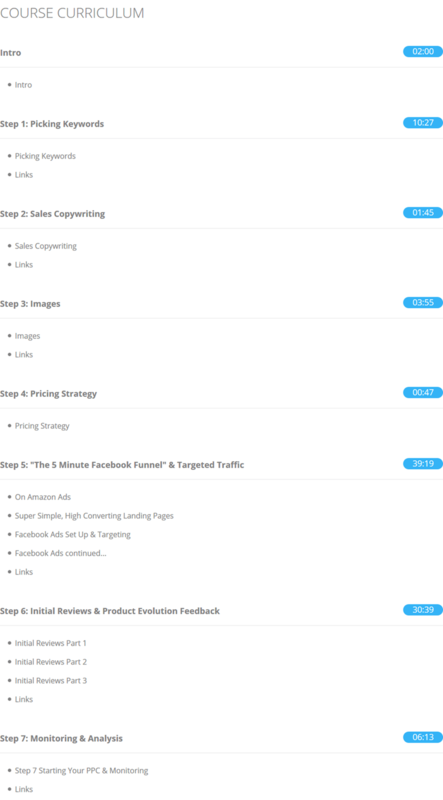 What you need is a way of launching products that Amazon likes, your customers like and that not only gets you ranked but also keeps you there. We’ve all seen the magic products that have no reviews that pop up on page 1 out of nowhere and then disappear just as fast. You don’t want to hack Amazon and trick them into ranking your product high only for it to fall off the face of the earth a few weeks later. You need to rank fast, stick and reap the rewards for years to come. That’s what I focused on when building this system. Speed and longevity of search rank. If you are looking for a quick hack that is super black hat then this is not it. But if you want something that will undoubtably make your product launches a success and help them to stick once they’re there then I invite you to let me show you what it’s all about. Join me on the next page and I will teach you my strategy, give you the system and everything you need to implement it. I have recorded a series of videos to help you get up to speed with and I have also included all the templates, automations and checklists you will need to successfully implement it. Your job will be to insert your product name, brand and click go. So if your ready to make time consuming, underperforming, costly Amazon product launches a thing of the past and instead focus on finding the next opportunity to grow your empire then click the button below and I will see you on the next page. Do you have an Amazon business? Do you want to grow by launching more products? Do you want to save time on your product launches, make them more successful than ever before and leave your competition wondering what secrets you know that they don’t? Don’t be silly, of course you do!! Just click the button and come see what it’s all about before one of your competitors does first! When you purchase this system, I want you to use it. I want you to really see how powerful it can be. I am confident that after 60 days you will know that and you will be telling everyone in our private Facebook group about your successes with it. So I’ll see you on the inside.